Looking out from under the awning of the tent during a rain shower towards a cattle byre at Yakwach, with cattle facing away from the prevailing storm. The published image suggests a date of August for the image, but since the image was almost certainly taken in 1935, it was probably taken in July when Evans-Pritchard carried out a small amount of further fieldwork among the Lou at Yakwach. Note on print reverse ms pencil - "64 4 A178 [numerous printer's marks]" & print front border ms ink - "NUER I/44"
Morton, Chris. 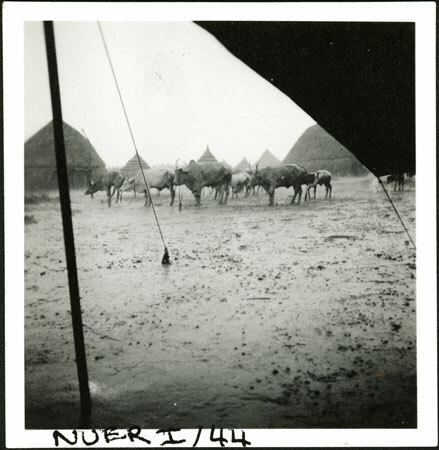 "Nuer rain in homestead" Southern Sudan Project (in development). 03 Jan. 2006. Pitt Rivers Museum. <http://southernsudan.prm.ox.ac.uk/details/1998.355.22.2/>.